When my son, Amaey, was diagnosed with Acute Lymphoblastic Leukemia (ALL) at the age of three, I was working full-time. My husband had the insurance from his company so we made a decision that I would quit and become a fulltime caregiver. I’m really glad we made that decision because what came ahead was nothing we had ever imagined. Once the diagnosis is made, and you are labeled a ‘cancer family,’ the road to a cure is a tumultuous one. What impact do you think not knowing what can happen at any given moment has on the child, their sibling, and the caregivers? You become part of a protocol, you almost become a number, your identity is the diagnosis, whether it is Leukemia, Lymphoma, Neuroblastoma, Osteosarcoma, or another type of cancer. You become a research study. My son believed in Science. My husband believed in the statistics. I believed in what I was hearing from the doctors. I hung on to every word and believed that if we were in the market to shop for cancer, ALL would have been the best because it had 85% survival rate. We were in the 85%. To make sense of the hours we were in and out of the hospital, to balance the number of times we were quarantined, and to support the many days of being by ourselves, I started taking my son to art and signed him up for Kindermusik so that he could feel elevated in his spirits. 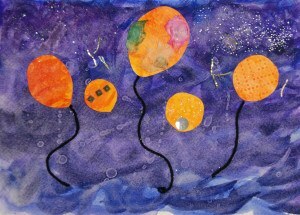 At home I started doing art projects with my son and his older brother and I saw how much they enjoyed them. I saw that the treatment had really left us isolated in many ways. If my son had low immunity, all four of us had to stay away from people. I realized that my older son was equally impacted by this isolation. In the hospital waiting room, I ended up seeing the same faces over and over and little by little my art community grew to include all those kids. That is how Kids & Art was born. When I founded it in 2008 I had never imagined that I would, one day, go full time on it. In 2009 I was nominated for the Woman of the Year campaign with the Leukemia & Lymphoma Society. My son should have been done with his three and a half years of treatment and I was to celebrate him as cancer-free during my campaign. As I went to win the nomination, the irony in all this is my son relapsed. Little did I know then that being a boy ran against my son, as he relapsed with testicular ALL. Nothing made sense at all. Here I was at our gala auction where we were displaying beautiful works of art created by the kids who were fighting cancer and their siblings, and here was my son, now six and a half years old, going in for another two years of treatment. Standing in that room at the gala filled with art and looking at all the kids guarding their bid sheets in amazement that people were actually fighting over their art, was a reassuring feeling that maybe all this color will balance the chaos in our life. Fast forward to 2011, my son relapses yet again, but this time with a chemo induced AML, a very aggressive form of cancer. After a 10-10 donor matched Bone Marrow Transplant we spent a very challenging 55 days quarantined in the hospital. The 55 days in the hospital were somehow manageable because of the hope that we will see the light at the end of the tunnel. But unfortunately our son passed away after battling cancer for six of his nine years. Today, when I look around my house and see all the art on my walls that was created by our boys, I see their smiles, I see their love, I see the memories. I really do not see the cancer in art. Their art is here as a lasting memory of the tenacity these kids show even though they have so much else going in their little lives. In 2013, after turning my back on Kids & Art for more than a year, I went back to it because my older son insisted that it is what his brother would have wanted. I agreed because nothing else made sense in my life. Just last week our artists went in to the oncology/hematology waiting room at Lucile Packard Children’s Hospital. Once a month we go in and do art with the children and families while they are waiting for their appointments. As the artists entered the waiting room they noticed that there was only one girl and rest of the patients were boys. They weren’t sure if they would come and create art with them. However once they laid out all the art materials, all of them flocked to the tables. One mom told an artist that her son does not really like art. Was she ever surprised to see that not only did her son sit down and create three pieces of art, he did not want to leave even though his appointment was over! To me, Kids & Art is here to empower and heal kids and their caregivers in a way that is not measurable in numbers, but truly measurable in their smiles. Visit Kids & Art here. Purvi Shah founded Kids & Art in 2008 after her son, Amaey, was diagnosed with acute lymphoblastic leukemia. After battling cancer for six of his nine years, Amaey passed away in September, 2011, and Purvi spent some time figuring out life and grieving her loss. Her older son, Arjun, inspired her to re-launch Kids & Art in 2013. Thanks to his insistence, since then, Kids & Art is now a full-time endeavor that continues to thrive. 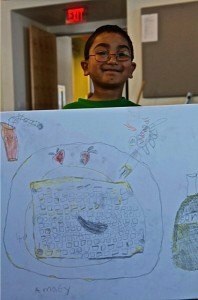 Kids & Art offers free monthly art workshops, and is developing new programs to serve families at Lucile Packard Children’s Hospital. At LPCH, artists visit the Oncology waiting room. Another pilot program serves Family House Inc, in San Francisco. Kids & Art plans to expand to partner with other facilities and seeks out creative partnerships in the community.